QUITO, Ecuador — One of Latin America’s most dangerous airports has seen its final landing. 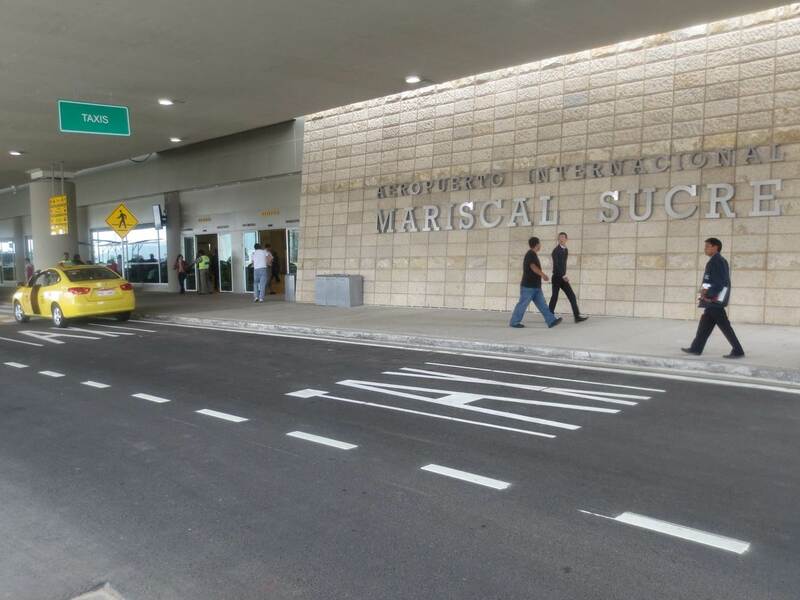 In late February, Mariscal Sucre International Airport opened in Quito, replacing the city’s old airport of the same name. The old airport was known for its short runway, high elevation and proximity to the Andes Mountains, making takeoffs and landings tricky — even for experienced pilots. There had been 10 serious accidents since the airport opened in 1960. Although the new airport is expected to be safer than its predecessor, it is farther from the city’s main attractions. The new airport is in a rural area northeast of the city, at least an hour’s drive from Quito’s historical downtown. Taxi fare is about $35. QUITO, Ecuador – In a northern Quito suburb called Carcelén, just a 15-minute drive south of the equator, sits a Jewish Community Center that – in its own way – is every bit as impressive as the Andean peaks and volcanoes that overlook it. Ecuador’s capital city is home to only about 700 Jews. Yet the 13-year-old Sede de la Comunidad Judia del Ecuador – the Jewish Community Center of Ecuador – is a multi-million dollar facility that is as expansive and lavish as you’ll find in many large American cities. I recently visited what the Jews in Ecuador simply call the “Community” as part of a five-day trip to Quito, a city of more than 2 million people. With an elevation of about 9,200 feet in a valley surrounded by the Andes Mountains, Quito is the second-highest capital city in the world. Even though it’s located so close to the Equator, the city’s elevation gives it a springlike climate year-round. After a one-hour taxi drive from my hotel in the city’s historic downtown district – a UNESCO World Heritage Site — I arrived at the hub of Ecuadorean-Jewish life. As I approached the complex, I was immediately impressed with its architecture of thick stone walls, resplendent arches and rust-colored domes that were much more evocative of Jerusalem than Latin America. Inside, I met with Rolf Stern, who runs Ecuador’s member firm of the BDO International accounting network and is just completing a six-year term as president of the Jewish Community. Following our meeting, I was given a tour of the complex by Sebastian Medina, the Community’s on-staff director. The heart of the complex is a beautiful two-story synagogue, complete with several exquisite stained-glass windows, and enough space to accommodate about 400 worshippers. Services at the Conservative temple are conducted by Rabbi Alexander Mylinski, who originally is from Argentina. 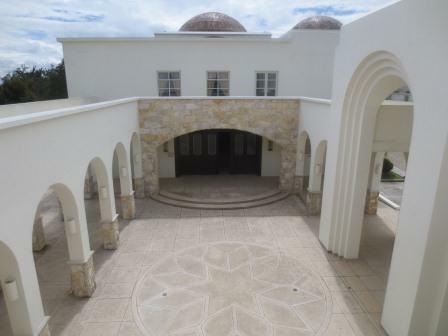 In addition to the synagogue, the Community has a mikvah, squash and tennis courts, a large indoor swimming pool, a youth center and its own soccer field. There is an on-site kosher kitchen and cafeteria. It not only offers home delivery, but also provides kosher food for some of the cruise ships that sail to Ecuador’s Galapagos Islands. The complex also boasts one of the largest ballrooms in Quito, which is used for bar mitzvahs, weddings and other social events. Stern said the complex was funded by the sale of the Community’s prior facilities as well as the financial contributions of Ecuadorean Jews. “We’re very fortunate and blessed in having a strong community sense, which is reflected by the generosity of our members, including the large donors,” he said. Just a couple of blocks away from the Community sits what Stern called “one of the three best schools in Quito” – the Albert Einstein School, which serves students from kindergarten through the 12th grade. The school was founded 40 years ago by members of the Jewish community; Jews still lead the school today. Even though 92 percent of its 660 students aren’t Jewish, all students are required to study Hebrew and learn about Jewish culture and history. Stern is typical of most Ecuadorean Jews in that his parents – German Jews – immigrated to the country in the late 1930s to escape the Holocaust. In 1950, the Jewish population in Ecuador peaked at about 4,000. That number steadily dwindled over the years, although Stern notes that there has been a slight rebound in the past five years. “What we’ve seen is that young members of the community who were working or studying abroad have now started to come back,” he said. Under Stern’s leadership, the Community has launched an outreach effort – called the “Community Growth Program” — designed to attract foreign Jews to migrate to Ecuador. “It’s a great place to live and bring up kids,” he said, adding that the relationships between Jews and the Ecuadorean government and the population at-large are excellent. The Community is in the process of building a new residence for seniors. Expected to open in 2015, it will initially have 12 suites, with plans to eventually grow to 20 units. 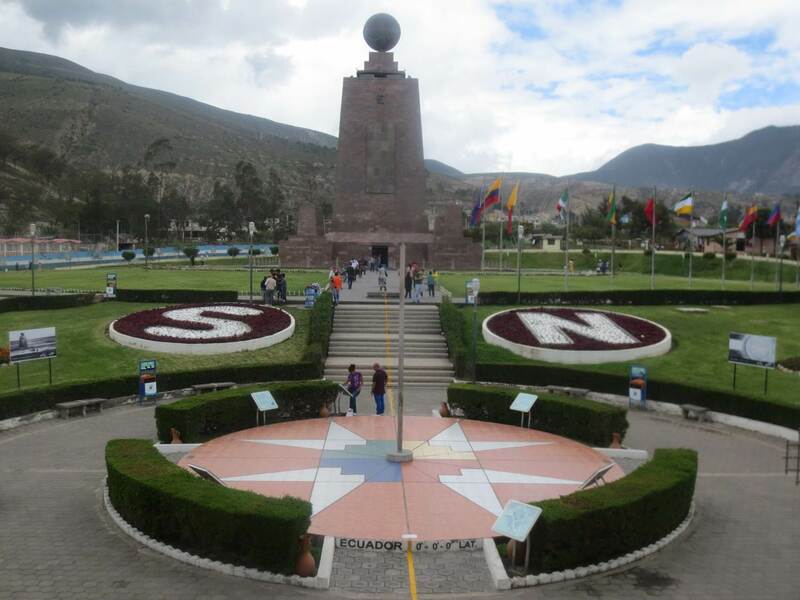 After my visit to the Community, I took a short taxi ride to perhaps Quito’s most famous tourist destination – La Mitad Del Mundo (the Middle of the World) – a monument at the site where a French scientist in 1736 calculated the equator to be. Turned out, he was off by about 600 feet. But it’s still a fun place to visit and pose for the obligatory photo with one foot in both the Northern and Southern Hemispheres. Later in the day, I visited an upscale Jewish-owned shopping mall in downtown Quito. There, I had lunch with Offir Adaki, an Israeli who has lived in Ecuador for 18 years. Adaki, who serves on the Community’s board, went backpacking in Ecuador after serving in the Israeli military. He so enjoyed the weather and the slower pace of life compared with Israel, he decided to make Quito his permanent home. Adaki owns a travel company called Ecuador Nature (www.ecuadornature.com) that brings Jewish groups — 50 percent of which come from Israel — to see the sites of Ecuador and the Galapagos Islands. He said he makes a point of taking each group to visit the Jewish Community Center for lunch. Stern said Jews planning to visit Ecuador are more than welcome to attend services and come for a kosher meal. Due to security issues, it’s best to send an email in advance to Sebastian Medina (dir.comunitario@cje.ec). Stern said Quito is also a great place to have a “destination celebration,” such as a wedding or bar mitzvah. “People should know that we are a very welcoming community,” he said. 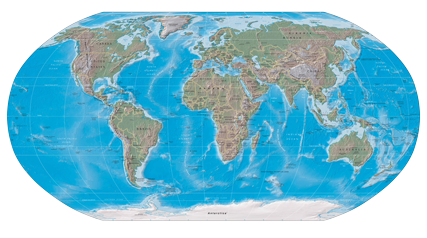 Will the Real Equator Please Stand Up? This is one of the most famous tourist attractions in South America. It’s a globe-topped monument called Mitad del Mundo – “middle of the Earth” in English. The yellow line dissecting the complex is supposed to designate the exact spot where the equator passes just a few miles north of Quito, Ecuador. It’s set in a beautiful park in the Andes Mountains and the entrance fee is a bargain — only $2 (Ecuador has adopted the U.S. dollar as its currency). Hundreds of tourists visit the monument each day to have their photos taken straddling the yellow line, with one foot in each hemisphere. I did the same. The monument is located at a site where a French scientist in 1736 calculated the equator to be. For the technology of his time period, he did a pretty good job. But with modern GPS technology, we learned a couple of decades ago that he was off by about 600 feet. But since the monument, museums, restaurants and souvenir shops had already been erected at this location, the Ecuadorean government decided to stick to the party line – literally and figuratively. 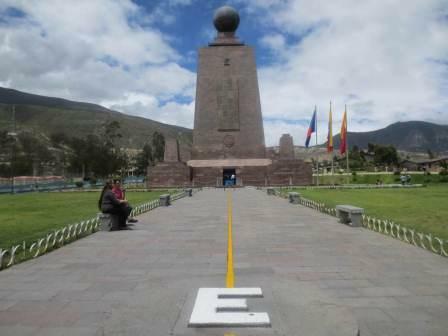 The real equator is about a quarter-mile north – or to the right – of where the monument was built. 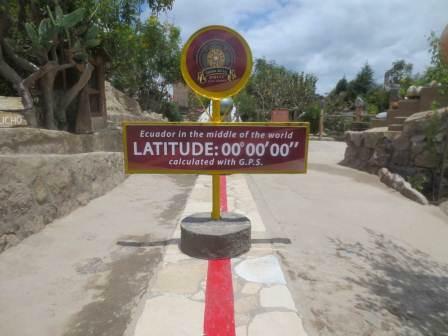 There, the equator is marked with a red line. To see it, visitors must pay $4 to enter a private attraction called the Intinan Solar Museum. Admission includes a guided tour featuring a number of fun — but fake — science experiments that supposedly demonstrate the powers of the equator’s force. For instance, our guide set up a portable sink a few feet north of the equator and we watched as the water went down the drain in a counter-clockwise direction. She then moved the sink south of the red line and sure enough, the water drained clockwise. It was more of a magic trick than a bonafide experiment, as scientists long ago debunked the urban myth that water drains in different directions in the Northern and Southern Hemispheres. And, after further research, I learned that even the newer “real” equator is now believed to be a bit off the mark. Yellow or red, it was close enough for me. I thoroughly enjoyed my visit to somewhere in the vicinity of the middle of the Earth.